Nothing says brunch like a Bellini, and this family friendly version by Anna Olson is perfect. 1. Combine honey and peach nectar and pour into 4 champagne flutes. Scoop sherbet into each glass and top with sparkling lemonade. 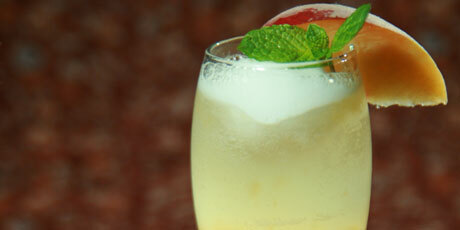 Serve immediately, garnished with peach slices and mint. 2. For a larger crowd, triple recipe and prepare in a punch bowl. Top with soda immediately before serving.